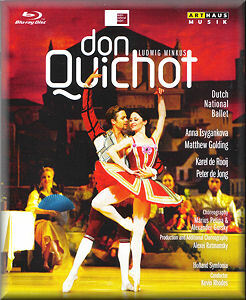 Minkus’ Don Quichotte is an unashamedly old-fashioned ballet. First presented by the great Petipa in 1869, the version performed today is based on Alexander Gorsky’s St. Petersburg production of 1902. On film, most probably remember Rudolf Nureyev’s Australian Ballet production of 1973, with Robert Helpmann as Don Quixote and Lucette Aldous as Kitri. Even though it’s been digitally re-mastered it looks terribly dated and somewhat lacking in visual appeal; that said, Nureyev’s testosterone-charged Don Basilio is surely one of the great performances of modern times. The enticing cover image on this new Blu-ray certainly makes the Dutch production look fresh and colourful, but does it deliver? From the outset – the Amsterdam audience greets conductor Kevin Rhodes and his Holland Symfonia with cheers and whistles – this promises to be a lively evening in the theatre. Indeed, Rhodes gets the ballet off to a fine start with a fizzing Prologue, during which we are introduced to the principal dancers and actors in slow-motion clips from the performance itself. The Library scene with Don Quixote and his hapless sidekick Sancho Panza – the latter endearingly played by Karel de Rooij – has plenty of low comedy but really it’s just a bookend for the first Act, which takes place in a sunlit Barcelona square. Sets are traditional, the action dominated by a Prussian-blue sky that contrasts nicely with the bright reds and russet tones of Jérôme Kaplan’s eye-catching costumes. Kitri, danced by the Novosibirsk-born ballerina Anna Tsygankova, makes a splendid entrance, her back-arching, high-kicking traversal of the stage quite mesmerising. As for the dashing Don Basilio of Canadian Matthew Golding, he’s overshadowed by Tsygankova at this point; still, he has a pleasing stage presence and dances very well indeed. Minkus provides a daisy chain of foot-tapping tunes that – quite literally – keep the dancers on their toes. The camerawork is discreet and unfussy, cutting kept to a minimum. We’re always aware of the proscenium arch and there’s plenty of to-ing and fro-ing as the ensemble pieces move across the wide stage and back again. Among the more spectacular numbers in Act I are the Pas de caractère and Quadrille featuring the cape-twirling Toreadors. Golding’s lifts are always rock-steady and the audience is quick to show its appreciation for the delectable set-pieces. As a production it has an exuberance you won’t find in the Nureyev film, while in the pit Rhodes is more than a match for ballet veteran John Lanchbery. The sound – in PCM stereo at least – is full-bodied, and the bright, high-res picture is very sharp indeed. Act II – the Actors’ camp and Quixote’s dream of paradise – is cleverly done. Kitri and Basilio’s gypsy pas de deux is elegant enough, but this Act really belongs to the old warrior and the dryades. Peter de Jong’s Quixote is finely judged, delightfully eccentric but with plenty of pathos as well. There are some whimsical touches in this Act, not least a wacky moon worthy of the Lumière brothers. The stroboscoped storm and Quixote’s collapse soon morphs into a nightmare complete with cartoon cacti, before being transformed – by an ingenious piece of stage business – into a stylised grotto filled with shimmering dryades. The dancing here is exquisite, the precise, geometric array of the corps de ballet very pleasing to the eye, the solos dispatched in great style. Maia Makhateli’s mischievous Cupid, complete with stubby little wings, is an absolute joy, and she deserves the applause that follows her variation. As for Sasha Mukhamedov’s aristocratic Queen of the Dryades and Tsygankova’s Kitri as Dulcinea, they’re beyond reproach; in both the en pointe dancing is supremely assured. Quixote, the master of ceremonies, brings the dream to an end with a flourish – cue the same piece of trickery in reverse – and within seconds we return to the agitated Sancho Panza, looking even more like a cross between Harpo Marx and Stan Laurel, fussing over his senseless master. And in a meeting of low comedy and high spirits, the Act ends with a relieved Panza and his delightful panto donkey skipping into the wings. Musically no-one could say this is a great score, but what it lacks in originality and flair it more than makes up for in energy and spectacle. And in Act III there’s plenty of both, from Kitri and Basilio’s entrance in the Tavern scene to Basilio’s feigned suicide and revival in the Barcelona square. As always the sets are minimalist, the rich colours and cunning shapes a feast for the eye. The now burnt-orange sky is certainly a fitting backdrop for the sultry Bolero, danced by Mercedes and Espada (Natalia Hoffmann and Moises Martin Cintas). But the night really belongs to Golding and Tsygankova, whose flawless dancing in the Adagio will take your breath away. It’s every bit as captivating as the Rose Adagio in Sleeping Beauty, and the spontaneous applause and roars of approval that ensue are richly deserved. It can’t get much better than that, surely? Well yes, it can – and it does. Among the solos that follow are two for Kitri and Basilio, danced with a freshness and precision that beggars belief after such a long, arduous evening. By now the audience is intoxicated, cheering every turn. And just as the Library scene is a bookend to this strange tale, so Quixote’s fiddle- and castanet-accompanied final dance and exit with Sancho Panza bring this production to a reluctant – but triumphant – close. As for bonus tracks, I can’t abide them; and watching these interviews with Golding, Tsygankova, de Rooij and de Jong I’m reminded why. Cobbled together by Lorenzo (Altin Keftira) they’re amateurish, noisy and frankly pointless, a rude shock after the slick professionalism of the ballet itself. Even worse is the gimmicky bodycam worn by one of the Toreadors in rehearsal. If you’ve seen a Friday night video shot on a mobile phone then you’ll know what to expect, atrocious sound and blurry, disjointed visuals. In mitigation, the glossy, multilingual booklet has an interesting interview with Alexei Ratmansky, a cued synopsis and production stills. I wouldn’t mind if I never saw Minkus’ La Bayadère again, but his Don Quichotte has found its way into my affections and will surely stay there. Filmed ballet doesn’t come much better than this, although with Carlos Acosta’s Covent Garden Romeo & Juliet awaiting review I might just be forced to eat my words. A treasurable disc and a must-see for all ballet fans.